Get a professional faucet installation by Clovis Plumbing Services! Offer applies to the purchase and installation of a lavatory or kitchen faucet. 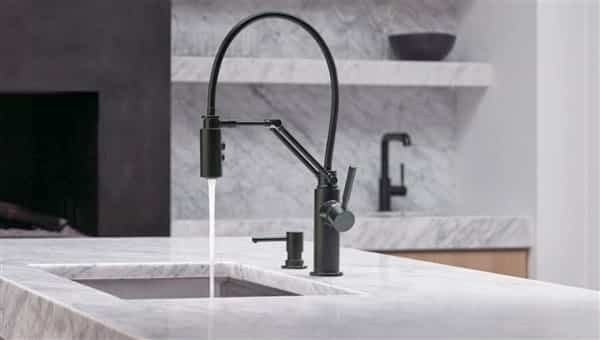 A new faucet installation has a way of revitalizing your bathroom or kitchen. The project has a huge impact by enhancing your daily satisfaction and adding beauty to your kitchen. Replacing the fixture is something anyone can do, but plumbing is something that should be left for a professional. There are many complications in faucet installations that can quickly be handled by an expert plumber. It usually cost about $244 to install a faucet but on average, $154 and $334 can get the job done. There are some factors that should be put into consideration in addition to those unanticipated problems that could arise. A situation where your existing faucet is rusted or is broken, there will be some challenges in an attempt to remove it. There will definitely be a difference in the price of installation depending on your needs and faucet selection. If you order one that doesn’t fit well, then you might have to do some configurations or replacing the sink entirely. The kind of materials the faucet is made of affects cost, though the cost of the installation may not be affected. It should be noted that upgrading to faucets with features like a filtration system or lighting will attract more cost. The total cost should include all hardware. If the current mounting or connectors have defects or are damaged, you will need to pay to have them fixed. Prior to installation, plumbing that is not up to acceptable standard might need to be properly fixed. For the efficiency of your faucet, you can go for certain specs specially designed for eco-friendliness. Depending on the nature and complexity of the job, you will have to pay for the workmanship. This can range anywhere from a hundred to three hundred or even more. It usually costs more for a kitchen faucet install than that of bathroom. This is most commonly because of the types and labor involved. Bathroom models are way smaller when compared to kitchen models. They have more features that demands more time for a successful installation. Installation can cost anything from $260 to $480, excluding any sort of repairs or upgrade. For washing dishes, vegetables or fruits, pull out and pull down faucets are great because of their flexibility. There is less flexibility in faucets which are mostly the default installation that comes with a sink. The flexible ones are quite expensive and needs the attention of an expert for the water control and plumbing. The designs for the bathroom are quite different from that of kitchen faucets. Even though there are some similarities, bathroom faucets do not come with water filters or sprayer hoses. Consider a simple design with double handles and a spigot that is capable of doing more than the basic function. There won’t be much difference in the cost of installation of bathroom faucets and that of kitchen. This cost excludes any pre-existing damages or defects that have to be repaired, which can likely increase the overall cost. It can be a DIY job if you want to install your own bathroom faucets. However, you might need to engage the services of a professional for more advanced designs like the touchless and push button. There won’t be much need to worry about some sort of upgrades or flexibility when it comes to bathtub faucets. How bathtub faucets functions is quite different. It is designed to accommodate a lot more water pressure to quickly fill up a tub. The installation cost might range from $150 to $350. The faucet installation needs to go in line with the plumbing, and if not, adjusting the tub’s plumbing might incur more cost. Most often, you can put a faucet that is both wall mount and freestanding depending on your kind of bathtub. Mount the faucet close to the wall to avoid vibration or jiggling in place.